The central area of KT. KT is a Metaroom created by Ghosthande and released for the CCSF 2009. It is named for the K-T boundary, and consists of both a subterranean level and an upper level which is home to a variety of flora and fauna. "KT is a fairly large, prehistoric-themed metaroom (or more accurately, a partial world) complete with dinosaurs, buried fossils, ancient monoliths and lush tree ferns. 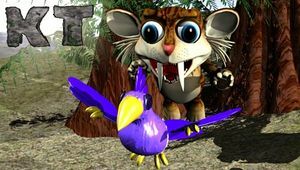 It comes with its own background music as well as a variety of new critters, plants and other agents, all of which utilize original 3D graphics." -- Breeders Beware. You can download KT from Breeders Beware. 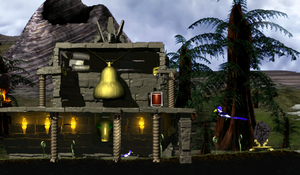 There are also several additional elements which are obtainable by using the temple cauldron. For the CCSF 2010, Ghosthande released an expansion known as The Bone Cave as an addon for KT. It adds an additional cave to the metaroom along with many other new features. You can download The Bone Cave from the CCSF 2010 website here, or Breeders Beware. Warning: Before you inject The Bone Cave into your world, you must highlight it in the Agent Injector and click the 'remove' button. This will clean up any old scripts in the metaroom so they can be replaced. The Bone Cave may now be injected safely into the world. This page was last modified on 15 February 2013, at 00:53.